Items made with enhanced fancy color are available upon request. Natural fancy colored diamonds are also available upon request. We provide a complete insurance replacement appraisal on any finished item of jewelry we sell over $1,000. 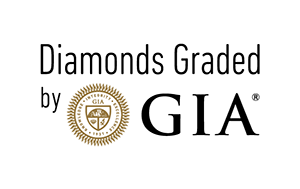 This service is at no additional charge and done by a GIA Graduate Gemologist. We want you to be completely happy with your decision to purchase using our services! We will ship the items to your home or office, and you will have 14 days to inspect the item. If you are not completely happy with your selection, just return them to us for a full refund, provided that the article has not been worn, sized, altered, center stone set, or custom made. If you would like to see the item before it is sized, altered, or the center stone is set, simply contact us and we will arrange to ship it to you for viewing and approval. This services is done at no additional cost to you. All diamond grading reports must be returned with the stone to receive a refund. We gladly offer three different kinds of shipping methods including 2-day FedEx insured at no additional cost. Next-day shipping available for an upgrade fee. We ship all items to you as soon as we receive them from the designer or vendor. Total time from placing the order to receiving the item is dependent on availability of goods ordered. If you have any questions about when you should receive your item, please contact us and we will be happy to give you as accurate an ETA as possible. All packages are insured up to $10,000. A fee may apply for additional insurance if the item exceeds $10,000. A signature is required for packages. Your package will not be left at your shipping location unless someone is available to sign for it. Upon request, we can have packages held at a FedEx hold station for you to pick up. All goods listed on the website are usually available now, however, some items may have been recently sold or out of stock. Once you place your order we will immediately secure those goods for you. If an item is not in stock, we will have a new one made for you and/or suggest a comparable item that is available sooner if you prefer. If a loose diamond is no longer available, we will research alternative comparable stones and contact you with those selections. If you would like to know if an item is available now, simply call or email us and we will be able to check the status of that item immediately. I am not finding what I want on the site, is there more available that you don’t have posted? Yes, there is. We have relationships with over 1,000 different designers and vendors. The wealth of that selection is staggering and simply not possible to put up on a single website. If there is something special that you can’t find or want a quote on, simply call or email us and we will be happy to find it for you. I am uncertain about buying something sight unseen. Can I see the item first before committing to it? I want to purchase an item but need to pay with two or more tenders. Is there a way to do this? Yes. Simply call us and we can arrange to split the amount over any combination of credit card, check, money order, or wire transfer that you wish. At this time, we do not. Retailers that offer payment plans and financing options maintain a higher markup to be able to absorb the fees and costs associated with financing. In order to maintain our lower pricing structure, we are unable to offer a payment plan option. Do you have a store or location in my area where I can view your merchandise? Our location is in Belleville, IL and we are primarily a web-based business that specializes in fine jewelry at insurance replacement pricing. We buy each item for you specifically from over 1,000 different designers and vendors. This enables us to provide policyholders and customers an amount of selection that is far too large to fit into a jewelry store. By doing this, we eliminate vast amounts of costs and overhead that would force us to raise our prices. By not limiting ourselves to on-hand inventory, we can offer you the broadest selection possible. We are happy, however, to ship available items directly to you for your viewing and approval at no additional charge to you. How do I know if my stone will fit into the setting I like? Almost every mounting on the site has the center stone size and shape it was made for. If you are not certain if your stone or a stone you are considering is a good match, simply contact us and we will be happy to examine the details of both to determine if they are suitable for one another. Many of the settings can be made for a different stone size than what is listed. This special order process usually takes approximately 6 weeks. Do you have a trade-in or upgrade policy? Unfortunately, no. Because our markup structure is lower than a traditional retailer and we do not sell refurbished merchandise, we do not have the ability to absorb the losses involved with exchanging worn merchandise for new merchandise. I do not see any fancy colored diamonds in the “diamond search.” Are natural fancy colored diamonds available? Yes. Shopping for a natural fancy colored diamond has many intricacies that differ from traditional white diamonds. We highly recommend you contact us directly so that we can work with you to find appropriate stones in this category.